Mold is used as a cylinder body forming machine, and it can be used by many kinds of press machines. 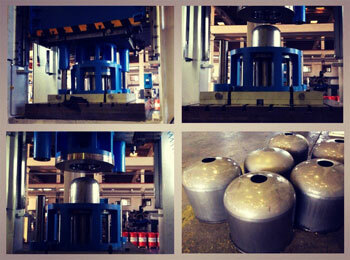 The biggest LPG creator of Turkey, "Aygaz", uses our molds for body forming of their LPG cylinders. We also support local and international "LPG Producing Line (Plant, Factory) Manufacturers"
This is a relatively old technology (LPG gas tubes for home users) for the Turkish market since natural gas is commonly used in homes. We have a long experience manufacturing all different shapes of these molds to satisfy our customers' needs.